Water is constantly in flux, changing phases between liquid, vapor and ice. Evaporation occurs as the sun heats water, transforming it from liquid to vapor. As this vapor rises, it condenses into clouds. Clouds can circulate the globe, depositing water molecules—by way of precipitation—thousands of miles from where they originated. This precipitation can be in the form of snow or rain. If snow falls in warmer climates, it often thaws and flows over land as surface runoff, just like rain. Runoff moves down slope, first into valleys where it reaches streams and rivers, and eventually to lakes or oceans. However, not all runoff ends up in a stream or river. Much of it soaks into the ground, percolating through sand, soil and rocks. Eventually, this water reaches an aquifer, a natural reservoir that stores large amounts of freshwater underground. Groundwater and surface water are often connected – water from the surface infiltrates into the ground and groundwater water replenishes water in rivers and lakes. Due to this connection, over-pumping of groundwater can decrease water levels in streams and lakes. Overuse of surface water can lower groundwater levels and ultimately decrease the amount of water in lakes, rivers and streams. This also has implications for bays and estuaries (where freshwater meets saltwater); they are dependent on river flows to keep salinity levels low and native plants and animals healthy. The EPA is a federal agency that writes and enforces regulations to protect human and environmental health. The EPA enforces the Clean Water and Safe Drinking Water acts, and protects watersheds and groundwater through pollution prevention and remediation. EPA Mission:Our mission is to protect human health and the environment. The IBWC is a binational commission established to apply boundary and water treaties between the United States and Mexico. The U.S. component of the IBWC is a federal agency that operates flood control structures, dams and reservoirs in order to ensure the accurate accounting of boundary and transboundary river waters. IBWC also focuses on water quality management through maintenance and monitoring, wastewater treatment and facilities management. Through the 2014 Farm Bill, the NRCS provides farmers and ranchers with technical and financial assistance to implement practices that will improve environment and agricultural operations, including irrigation and drainage management, stream restoration, water quality improvements, sediment control, watershed protection, fish and wildlife enhancement, and flood mitigation. The USACE is a federal agency under the Department of Defense that designs, constructs, and operates dams, canals and flood protection. The agency also plays a role in providing ecosystem restoration, coastal protection, hydropower and recreational opportunities. USACE Mission:Deliver vital public and military engineering services; partnering in peace and war to strengthen our Nation’s security, energize the economy and reduce risks from disasters. The USBR is best known for the dams, power plants and canals it has constructed in 17 western states; Texas-based USBR projects include the Choke Canyon, Sanford and Twin Buttes dams. USBR is the largest wholesaler of water in the country and works to meet increasing water demands while protecting the environment and the public’s infrastructure investments. USBR Mission:The mission of the Bureau of Reclamation is to manage, develop and protect water and related resources in an environmentally and economically sound manner in the interest of the American public. The USFWS is dedicated to the conservation and management of fish, wildlife and natural habitats. The agency enforces federal wildlife laws, protects endangered species, manages migratory birds, restores nationally significant fisheries, and conserves and restores wildlife habitat. The USFWS also manages 150 million acres of wildlife refuges across the country. USFWS Mission:Work with others to conserve, protect and enhance fish, wildlife and plants and their habitats for the continuing benefit of the American people. The USGS is a science organization that provides information on ecosystem health, natural hazards, natural resources, and climate and land-use change. As the nation's largest water, earth and biological science and civilian mapping agency, the USGS collects, monitors, analyzes and provides scientific understanding about natural resource conditions, issues and problems. USGS Mission:The USGS serves the nation by providing reliable scientific information to describe and understand the Earth; minimize loss of life and property from natural disasters; manage water, biological, energy and mineral resources; and enhance and protect our quality of life. TCEQ is Texas’ statewide environmental agency; the Office of Water is a branch of TCEQ responsible for protecting the state’s water resources. The commission oversees public drinking water standards, water rights, groundwater protection, water districts, surface water quality monitoring and many other major programs and initiatives. TCEQ Mission:The Texas Commission on Environmental Quality strives to protect the state's public health and natural resources consistent with sustainable economic development. Our goal is clean air, clean water and the safe management of waste. TPWD provides continued access to outdoor recreational opportunities through the management and protection of wildlife, wildlife habitat, parklands and historic areas. The Inland Fisheries Division of TPWD oversees the state’s freshwater fisheries; their goal is to maximize statewide angling opportunities while protecting Texas’ freshwater resources. Some responsibilities include ecosystem and habitat assessment, instream flow studies, wetlands conservation, permitting, and fisheries management. TPWD Mission:To manage and conserve the natural and cultural resources of Texas and to provide hunting, fishing and outdoor recreation opportunities for the use and enjoyment of present and future generations. The TSSWCB administers soil and water conservation law and coordinates conservation and pollution abatement programs. They offer technical assistance and administer grants to the state’s soil and water conservation districts (see SWCD definition below). TSSWCB Mission:It is the mission of the TSSWCB, working in conjunction with local soil and water conservation districts, to encourage the wise and productive use of natural resources. It is TSSWCB’s goal to ensure the availability of those resources for future generations so that all Texans' present and future needs can be met in a manner that promotes a clean, healthy environment and strong economic growth. Created in 1957, TWDB plays a vital role in planning for Texas’ water resources and providing affordable water and wastewater services. TWDB accomplishes this through water planning, data collection, and offering financial and technical assistance to Texans. The organization provides water conservation funding for agricultural water projects and loans to local governments for water supply and water quality projects. The board also administers the Texas Water Bank and Texas Water Trust. TWDB Mission:To provide leadership, information, education and support for planning, financial assistance, and outreach for the conservation and responsible development of water for Texas. A district charged with developing and implementing a plan for the effective management of local groundwater resources. The management plan must be designed to achieve desired future conditions (see definition below). GCDs are often organized by county and often regulate the spacing and/or pumping of groundwater wells. GCDs were created by the Texas Legislature, in part, as a response to the rule of capture. River authorities are public agencies that manage the state’s rivers through conserving, storing, controlling and distributing the water. They can manage water supply, energy production and recreation. There are 24 river authorities in Texas and each entity determines their management strategies. SWCDs are locally governed and landowner operated, giving local farmers and ranchers the opportunity to determine how to solve local soil and water conservation problems. The TSSWCB (see definition above) provides technical and programmatic assistance and administers grants to SWCDs. Aquifer - A layer of underground rock that is able to hold water due to its permeable nature, meaning liquids and gases can pass through. Aquifers fill with water from rain or snowmelt and act as reservoirs for groundwater. Texas has nine major aquifers (defined as aquifers producing large quantities of water in large areas of the state) and 21 minor aquifers (defined as aquifers producing large quantities of water in small areas or small quantities of water over large areas). Estuary - A body of water where a river meets the sea, resulting in the mixture of freshwater and saltwater. Reservoir - A natural or artificially created body of water (above or below ground) used as a freshwater supply source. River basin - The area of land that water flows across on its way to a river or stream. A sub-basin is a smaller section within a larger river basin. There are 15 major river basins in Texas and eight minor coastal basins. River network patch - An area of a river that is homogenous within its boundaries but unlike the surrounding areas. These patches can vary in shape and size and differ as a result of runoff, vegetation, geology and flows. Watershed - An area of land, often separated by ridges or other high points, that drains all of the streams, rainfall and snowmelt. Water use - The use of water by humans. In Texas, freshwater from rivers, aquifers, lakes, and reservoirs is used for a variety of purposes. TWDB (see definition above) collects an annual water use survey that breaks down water use by sector. These sectors include municipal, manufacturing, stream-electric power, mining, livestock, and irrigated agriculture. Read more about (annual water use estimates). Water use is often also broken into two categories: consumptive use and non-consumptive use. Consumptive water use - Water removed from the water system that is “used up” and does not return. Example: the water that evaporates or is transpired by grass when you water your lawn and does not percolate through the soil to return to the river or aquifer. Non-consumptive water use - Water that either remains in the water system or is withdrawn from a surface or groundwater source, but returns to the water system. Example: the water that is pumped from a river to cool a power plant and is subsequently returned to the river. Water withdrawal - Water that is diverted from a surface water source, such as a stream or reservoir, or pumped from groundwater. Water rights - Defined by Texas Water Code Sec. 11.002 as “a right acquired under the laws of this state to impound, divert or use state water.” In Texas, surface water belongs to the state and can be used by landowners with the state’s permission (a “water right”) while groundwater belongs to the owner of the land above it. Prior Appropriation - A legal doctrine pertaining to surface water defined as “first in time, first in right.” A person who receives a permit to put water to beneficial use has a water right senior to those who receive a permit subsequently. During water shortages, those with more senior water rights will receive all of the water to which they are entitled before junior rights holders receive their entitlement. Riparian Doctrine - A legal doctrine that states water rights are associated with the land bordering a river, stream, pond or lake and owners of that land have a right to that water for reasonable use. In 1967 the Texas Legislature merged the riparian rights system into the prior appropriation system, consolidating surface water rights into one system. Beneficial use - Defined by Texas Water Code Sec. 11.002 as “use of the amount of water which is economically necessary… when reasonable intelligence and reasonable diligence are used in applying the water to that purpose and shall include conserved water.” Beneficial use includes domestic, municipal, agricultural, industrial, mining, hydroelectric power, navigation, recreation, public parks and game preserves, among other things. Senate Bill 3 (SB3) - A bill that establishes a process for determining environmental flow standards for all of the major river basins and bay systems in Texas. The process was designed to be accelerated, scientific and stake-holder driven. The SB3 process is designed to address three major questions: (1) How much water is needed to sustain a sound ecological environment in the state's rivers and estuaries? (2) How can this water be protected? (3) What is the appropriate balance between water needed to sustain a sound ecological environment and water needed for human and/or or other uses? 303(d) listing - 303(d) is a section of the Clean Water Act that requires states to submit lists of impaired bodies of waters to the Environmental Protection Agency. Waterbodies are considered impaired if they do not meet state water quality standards. The law requires that states develop Total Maximum Daily Loads (TMDL) for pollutants in these waterbodies. Endangered Species Act - An act passed by Congress in 1973 to protect and recover species at risk of extinction, as well as their habitat. Acre-foot - A measurement of water volume that covers one acre of land, to a depth of one foot. It is equivalent to 325,851 gallons. 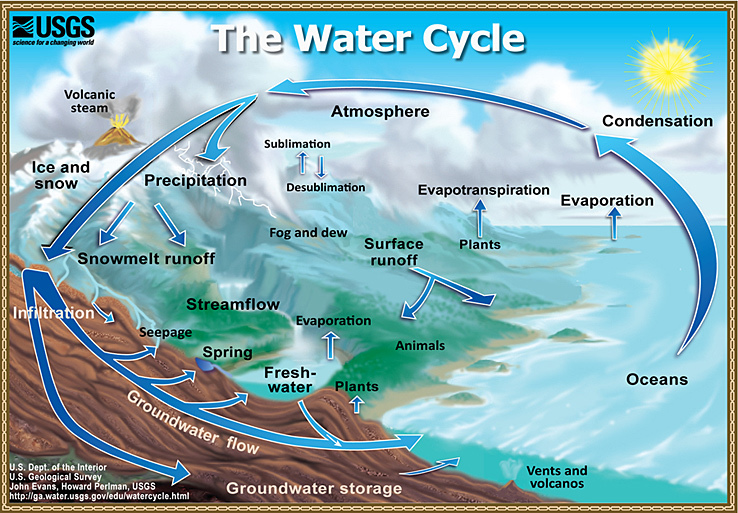 Base flow - The portion of water in stream flows that comes from groundwater, not surface runoff. CFS (Cubic Feet per Second) - The flow rate of one cubic foot of water passing through a given point during one second. One CFS is equivalent to one cubic foot of water per second. 1 CFS = 448.8 gallons per minute. Gallons per kilowatt-hour - The thermoelectric generation of a kilowatt-hour requires a withdrawal of 25 gallons of water. However, most of this water is non-consumptive and used in the cooling process. The number of gallons of water consumed per kilowatt-hour can range from two to eight. Gallons per capita per day - The number of gallons of water an individual uses in one day. This number is usually expressed as an average in order to measure water demand. Water loss rate - The rate at which water leaks from supply systems. Water that is diverted or withdrawn but is not delivered for beneficial use is referred to as ‘lost’ or ‘unaccounted for.’ Due to greater water demands, water supply managers are improving their systems to decrease the water loss rate. Aquifer storage and recovery - A water resources management practice that involves injecting water into an aquifer for storage purposes so that the water can be withdrawn during times of shortage, such as peak summer months or drought. DFCs (Desired Future Conditions) - DFCs are defined by the Texas Administrative Code as "the desired, quantified condition of groundwater resources (such as water levels, spring flows, or volumes) within a management area at one or more specified future times as defined by participating groundwater conservation districts within a groundwater management area as part of the joint planning process." In Texas, DFCs are set jointly by the GCDs in a region through the Groundwater Management Area process. GCDs are required to manage their resources with the goal of achieving DFCs. GMAs – Groundwater Management Areas - A framework set forth by House Bill 1763 in 2005 for regional collaboration among GCDs for management of shared aquifers. Most GCDs are organized by individual counties and therefore only manage a portion of the aquifer. GMAs create a framework that enables neighboring GCDs to work together on management goals for their shared aquifer. The GMAs determine the desired future conditions for their aquifers. Inter-basin transfer - Transferring water from a basin with a real or perceived surplus to another basin where water is less available or does not meet human demands. This is often accomplished through man-made systems such as pipelines. MAG (Modeled Available Groundwater) - In the context of the GMA process, the MAG is the amount of groundwater production, on an average annual basis, that will achieve the DFCs. The MAG is determined by TWDB using groundwater models after the DFCs are set by the GMA. MAGs are most commonly defined at the county level for any relevant aquifer in the county. Presumptive standard - An environmental flow standard that can be used for rivers where detailed hydrology and ecology studies have not been performed. The presumptive standard is defined as upper and lower boundaries around hydrology measures such as daily or monthly flows that represent a sustainable range for maintenance of ecological integrity. Total Maximum Daily Loads (TMDL) - The maximum amount of a pollutant that a body of water can receive while still meeting water quality standards. Also refers to a plan to mitigate the violation of a water quality standard through restoration and/or protection efforts. Watermaster Program - A program, administered by TCEQ, that ensures compliance with water rights. A watermaster conducts field inspections, monitors stream flows, reservoir levels, and water use to prevent the waste or unreasonable use of water. Watershed Protection Plan (WPP) - A WPP is a way for stakeholders in a watershed to ensure the long-term health of surface and groundwater resources through the development and implementation of water quality protection and restoration strategies. RWPG – Regional Water Planning Group - In 1997 the Texas Legislature established a water planning process based on a bottom-up, consensus-driven approach, resulting in the creation of 16 RWPGs in Texas. Each RWPG produces a regional water plan every five years, which is then sent to the Texas Water Development Board for approval. Regional water plans evaluate and quantify existing water supplies, identify surpluses and needs, evaluate water management strategies and their associated impacts on water quality, recommend regulatory, administrative and legislative changes, and describe how sponsors of water management strategies will finance projects. Environmental Flows - The quantity and timing of water flows required to sustain native plant and animal species in freshwater and estuarine ecosystems. Invasive species - Plants or animals that are not native to a given ecosystem. Invasive species can cause damage to the environment, the economy and human health. River fragmentation - The interruption of a river’s natural flow by dams, inter-basin transfers or water withdrawals.